NASA’s Curiosity rover captures image of strange rock formation on Mars. The team compared the rock circle with another formation which was discovered in 2015, which looked to have similarities to Stonehenge. 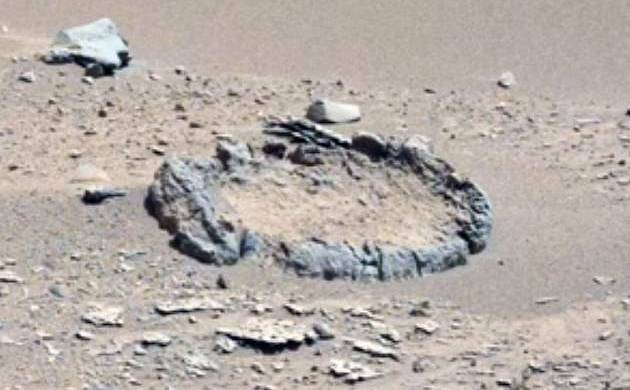 NASA’s Curiosity Rover has captured a mysterious rock ‘circle’ formation on Mars, giving another chance to the alien hunters of speculating about presence of alien life on the red planet. NASA’s Mars Curiosity Rover captured the picture of the rock formation this week. The alien hunters have now claimed that the rocks were ‘arranged’ and laid out by another form of life. They have even suggested that it may be a part of a larger never seen before structure which might have now been buried. “Whatever we're seeing here, it's in a perfect circle and it's much different from the craters that we normally see on Mars and the moon and throughout the other planets in the solar system. This almost looks like these rocks were arranged in this circular formation,” one space enthusiast said in a video posted by the YouTube channel SecureTeam10. “Either that or this could potentially be some sort of ruin. One thing's for sure, I've never seen anything quite like it on Mars. It just looks eerily out of place,” he added. They compared the rock circle with another formation which was discovered in 2015, which looked to have similarities to Stonehenge. The ‘discovery’ which was found on the top of a raised mound was named as Marshenge. However, experts denied it was an evidence of alien life and said that it was more likely formed due to natural geological phenomenons that are also witnessed on earth. However, the claim that the newly spotted rock circle proved extra-terrestrial existence couldn’t convince the internet users. “It's most likely geological. different rock minerals can sometimes make circles like that. The outer circle is made of different mineral than surrounding area,” said one. In the recent past, alien hunters have claimed to spot tree stumps and pyramids on Mars. An image captured on March 25 by the HiRISE instrument on NASA’s Mars Reconnaissance Orbiter during late stages of summer in Mars’ southern hemisphere, showed a strange circular formation and the surrounding ‘Swiss cheese terrain’ on the red planet.